After police efforts proved fruitless, the family of a kidnapped woman demonstrated why the Second Amendment is important when they took matters into their own hands last Friday. They confronted the abductor at his hideout and killed him, rescuing the victim. 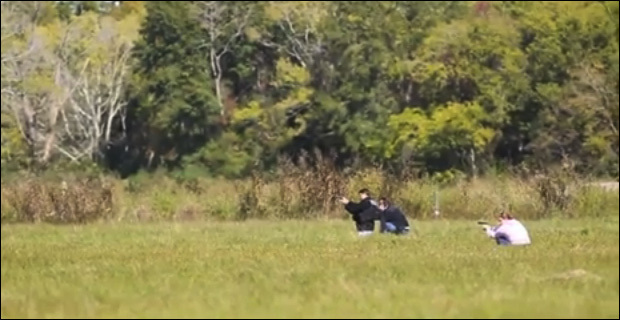 Image shows rescue of bloodied kidnap victim. 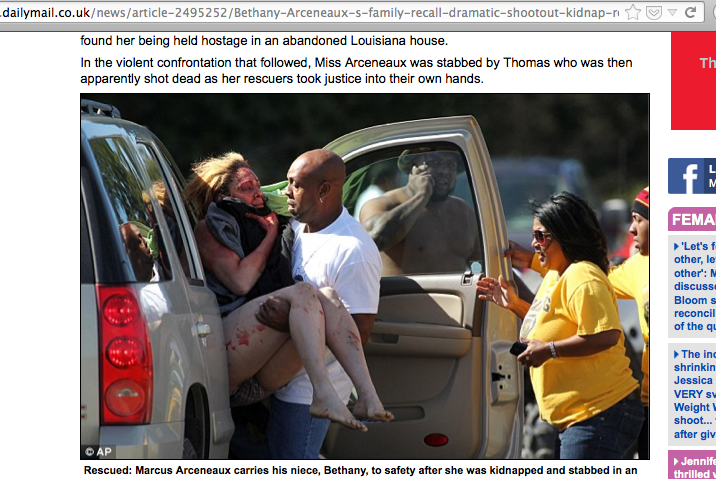 “Rescued: Marcus Arceneaux carries his niece, Bethany, to safety after she was kidnapped and stabbed in an abandoned house” / Screen grab via DailyMail.co.uk. A tipoff to her whereabouts sparked the search for 29-year-old Bethany Arcenaux in an abandoned house in Duson, Louisiana yesterday morning. She was suspected to have been abducted earlier in the week by 29-year-old Scott Thomas, the father of her 2-year-old son. Family members described hearing screams when they entered the home. Inside they found Bethany, “bloodied and repeatedly stabbed,” reports The Advertiser. Initial reports say Thomas was “harming her” when the family confronted him and exchanged fire, killing him. “We didn’t wait, we got up this morning and we did what we had to do. We did not wait for the authorities, we did it our own selves,” another sibling, Harold Carter, said of the ambush. Carter says he’s relieved they were able to find Bethany before something worse happened. Another relative said it was “upsetting” Bethany was found by family members and not police, a criticism Lafayette Police Department spokesman Cpl. Paul Mouton doesn’t think is fair. Police aim guns at house where kidnapper holed up. While investigators are still working to piece together exactly what took place, Lafayette Parish Sheriff’s Capt. Kip Judice says it doesn’t appear as though any of the family members would be charged with a crime. “The man began harming her. He (Arceneaux’s family member) did what he needed to do to stop that aggressive behavior from Mr. Thomas,” Judice said. The family’s rescue is a great reminder to gun control advocates that, in the hands of citizens, firearms do indeed stop violent crimes.